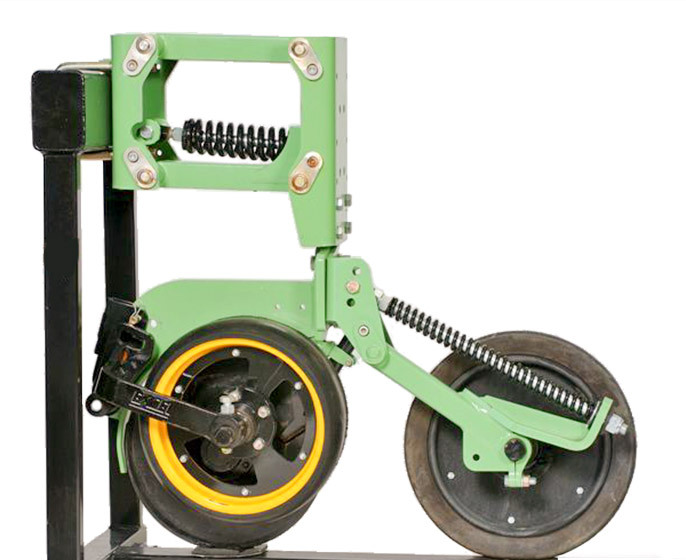 A compact double disc unit built on the 1 ¼" parallelogram, ideal as an airseeder fed, summer or winter seeding unit. Performs well as an applicator for granular fertilizer or anhydrous. 16" 4mm double disc unit. Tungsten scrapers fitted to double disc. Single closing wheel on HT hub assembly. One size HT Bearing with marine seals used throughout. 1¼" Stainless Parallelogram pin on polymer bushes. Horsepower requirements 3-5 H.P. per row unit. Perfect ground following with the 1¼" parallelogram with a full 12" of travel. Contact us at Excel to discuss your NR100 parallelogram double disc row unit requirements.